By the early 1970s. the industry country designated two poles: on the one hand is the link with the musical tradition and the hillbilly theme, on the other - the attraction to the stage and the mass audience. It is popular one of these two tendencies since will determine the genre in a given period. 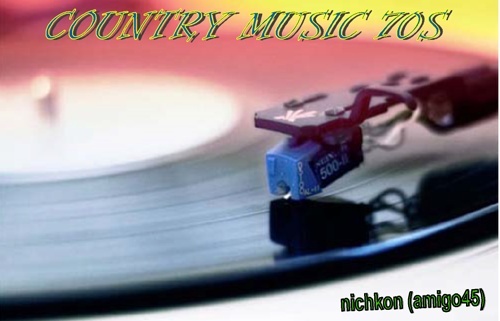 In keeping with traditional country music career began Loretta Lynn, Merle Haggard, Willie Nelson and Waylon Jennings. However, the greatest success in the second half of the 1970s. received just performers, significantly sterevshie boundaries between country and pop music: Conway Twitty, Glen Campbell, Anne Murray, Kenny Rogers, Barbara Mandrell, whose record is so little different from pop music that between country music radio stations there are fierce debates about whether this or that fits a song in their format. The highest peak is the pop-country reached at the turn of 1970-1980-ies., Last but not least, thanks to the movie "Urban Cowboy", caused widespread interest in the country. 025. Joshua - Dolly Parton (1971). 098. Moody Blue - Elvis Presley (1978). 099. She Thinks I Still Care - Elvis Presley (1978). 100. Slide Off Of Your Satin Sheets - Johnny Paycheck (1978). 101. Only One Love In My Life - Ronnie Milsap (1978). 102. Say You'll Stay Until Tomorrow - Tom Jones (1978). 103. Till The End - Vern Gosdin (1978). 104. Yesterday's Gone - Vern Gosdin (1978). 109. Backside Of Thirty - John Conlee (1979).